Other Info: It's "Westone", though I've seen them called "West One" as well. I'll put up both just in case. 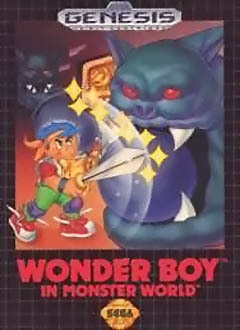 This game is also known as "Wonder Boy V: Monster World III". 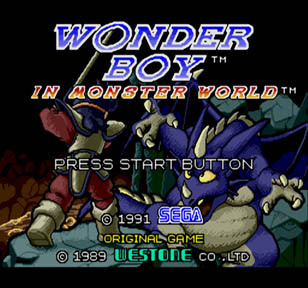 Wonder Boy In Monster World is a simple but enjoyable title Sega brought over in 1991. 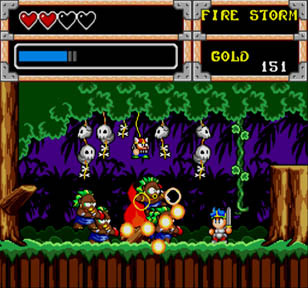 While the game had a little bit of popularity in the U.S., the game was fairly popular in Japan and the game is part of a fairly large series. The most recent game (as of this writing) is Sega Ages 2500 Vol. 29: Monster World Complete Collection for the PS2. 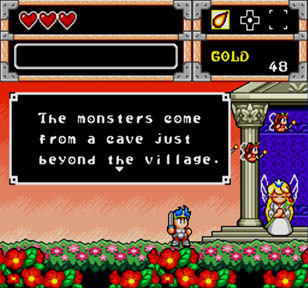 It features many different versions of several Monster World/Wonder Boy titles and was released in March of 2007 in Japan (No word of a U.S. release as of this writing). In this game, You are Shion, who just wakes up one day and wants to make his world a better, safer place because the monsters are out of control and not a lot of people care to do anything about the problem. Be warned. Shion is a silent protagonist. He offers no feedback whatsoever and you never know what he's thinking or what kind of personality he possesses, other than he's a pretty nice guy. It's not like you go from point A to point Z without any dialogue, but the plot is very cookie cutter and typical. The graphics aren't mind blowing, but they are very colorful and kind of state-of-the-art for its time. The backgrounds and foregrounds look great, and some kind of have this SMW2: Yoshi's Island appeal to it. It's really nice, especially for 1991. The character and enemy models aren't really detailed, but they are clean, nicely colored, and animate fairly well. 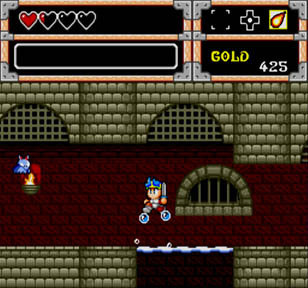 Many compare this game to Popful Mail (For Sega CD)...they aren't quite the same, but I do see several similarities. The sound in this game is surprisingly good. It's very appropriate and nicely accents the cute characters and environments.The sound effects are fairly typical. The graphics and sound shouldn't do you any harm. The bigger problems come into Shion...the way he fights and the relevance of some of his equipment and techniques. Shion uses two kinds of weapons: Swords and Spears. Spears are often better than having a sword and shield, and you can still deflect things with your spear by twirling it. If you're extremely close to an enemy, you can even twirl it until they die (if the enemy is cornered). Your sword has fairly short range. 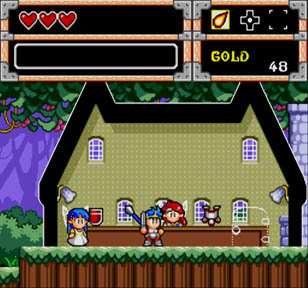 You can get temporary party members, who help you in a certain area (example: The fairy doesn't want to leave a certain part of the forest/village etc.). You have six spells. They're useful, except for the Shield spell. It gives you minimal protection against projectiles. You can't really fight with the shield though, because getting too close causes you to get hit and your shield is gone in a second that way. At the same time though, you can't always jump over the enemy or avoid it, so I never use that spell. Spells like Quake obviously won't hurt flying enemies. Like in a Zelda fashion, you can find spells scattered all over the world, as well as things to increase your maximum number of hearts (Life). You have items to bring you back to life if you die too. 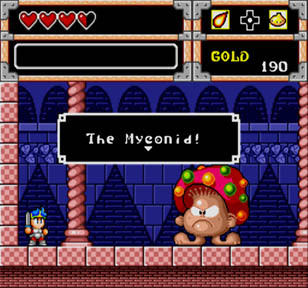 With certain items, you can craftily swim underwater, or stay hydrated in a desert, or even become a pygmy (tiny creature to go into tiny rooms and dungeons). The game is pretty short though, but it's certainly worth the small amount it goes for. One of the things I like best about this game is how it introduces the bosses (In a Popful Mail fashion). 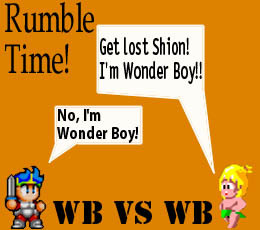 WBIMW is a good, overlooked game, and while it doesn't offer anything revolutionary to this genre of games, it's still fun nevertheless.